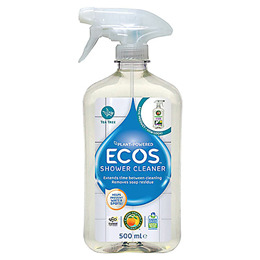 Formulated to be truly pure, green and effective, the Shower Cleaner helps prevent limescale and soap residue build-up in the shower tray, tiles and glass surround. Pleasantly scented with tea tree essential oils. Shower Cleaner is also a convenient multi-surface cleaner suitable for use around the bathroom. Apply after each shower to maintain stain-free tiles and glass. Vegan, cruelty free and carbon neutral. Water, Denatured Alcohol, <5% Non-Ionic Surfactants, Sodium Citrate, Sodium Gluconate, Potassium Sorbate, Citric Acid, Aloe Vera Leaf Juice and Perfume. Shake well before using. Spray a fine mist onto glass, tub, tile and fixtures after each shower or bath. Avoid contact with eyes. If contact occurs, flush with plenty of water. 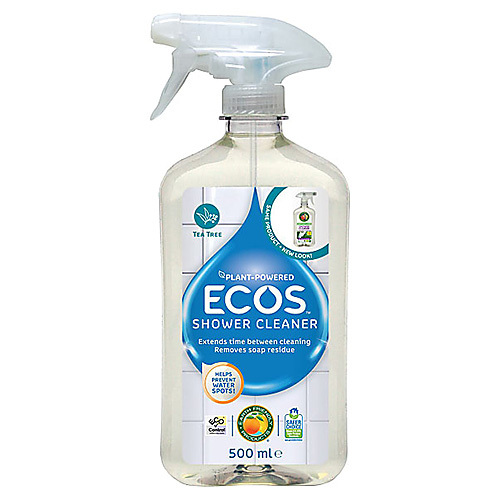 Below are reviews of ECOS Shower Cleaner - Tea Tree - 500ml by bodykind customers. If you have tried this product we'd love to hear what you think so please leave a review. Effective cleaner with a pleasant aroma. Ideal if you do not like strong chemical smells.